On 21 and August 22, 1972 near the Ionian coast of Marina di Riace, the police and the men of the Archaeological Superintendence of Reggio Calabria made a spectacular recovery of two large bronze statues, buried for centuries under the sand of the sea bottom: from then on they were known as the Riace bronzes. The statues had been sighted six days before by Stefano Mariottini, a Roman chemist doing underwater fishing. It was the first great mass phenomenon related to underwater archeology: ancient beauty seems to have an almost immediate impact in our time. The need for beauty is still connected to Greek culture, Greek beauty is still the most understandable; it was founded on nature with a strong intellectual foundation, the artists were also men expert in geometry and theoretical calculation. The soil inside the statues was analyzed and it became clear that the so-called Bronze A - the younger one with the "nasty" air, teeth coated in silver, a peremptory look, a position turning to his right - had been cast in the city of Argos,The other statue, Bronze B (the older one) would instead be Amphiaraus, a warrior prophet who foresaw his own death beneath the walls of Thebes. Both in fact participated in the legendary expedition of the city of Argos against Thebes, which had a disastrous ending. 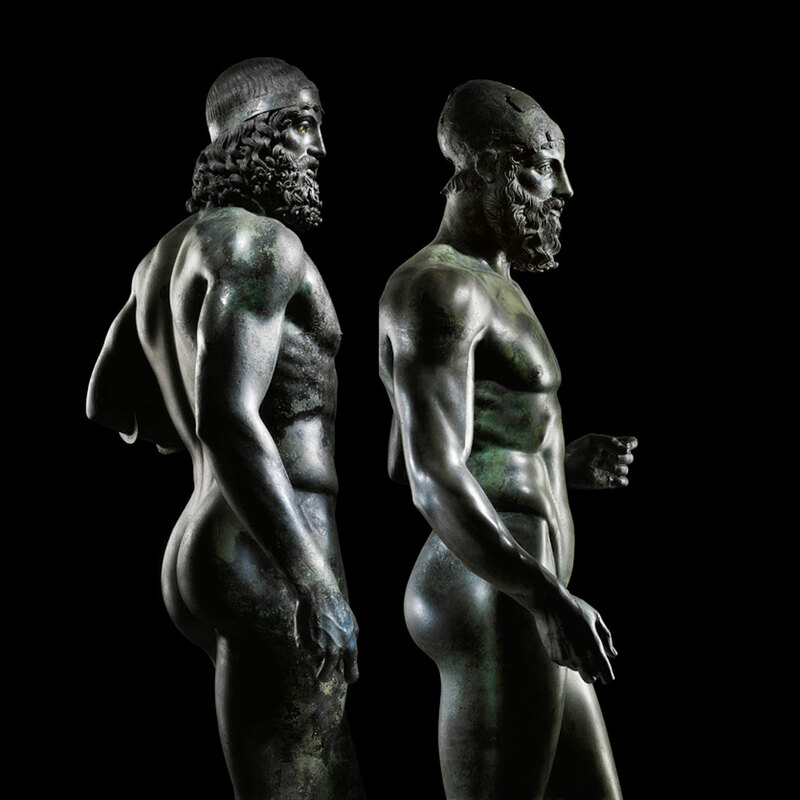 The bronzes have considerable muscle elasticity being in a position defined as "chiasmus" (from the Greek letter "chi"). More specifically, bronze A (the Young man) appears more nervous and vital, while bronze B (the Old man) seems more relaxed. The statues convey a remarkable sense of power, mainly due to the arms being strongly distanced from the body. The bent arm was certainly holding a shield, the other hand a weapon. Bronze B's head is oddly shaped and appears small because it allowed the placement of a Corinthian helmet. The right arm and the left arm of the B underwent a second welding, probably for a restoration in antiquity. The study of the materials and casting technique reveals a certain difference between the two statues, which might be attributed to different artists or, if made by the same artist, to distinct periods or different places. The first civilization capable of realism had used exaggeration to go further, and it's that instinct which still dominates our world today. The ancient Greeks cared about physical perfection, and so did Michael Angelo: he too created unrealistic bodies that were more than human, what artists chose to exaggerate was to express more than realism could." 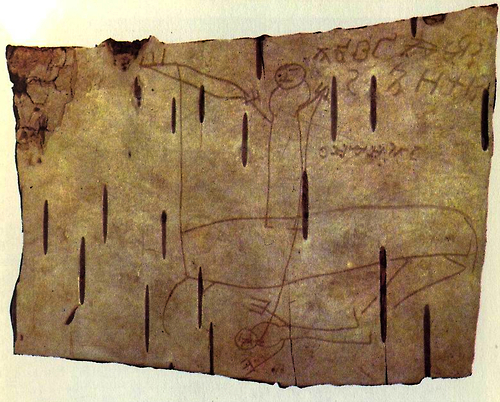 This drawing was made 700 years ago by a 7-years-old boy named Onfim who lived in Novogrod. 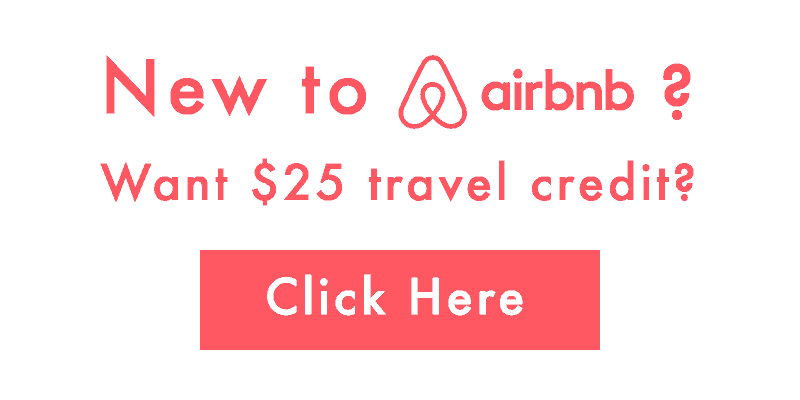 Here’s something very special. 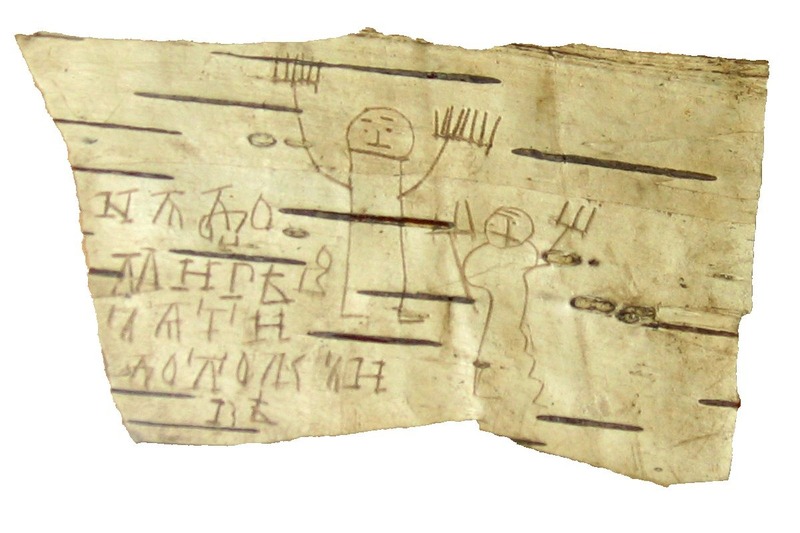 In the 1950s archeologists made a great discovery near the city of Novgorod, Russia: they dug up hundreds of pieces of birch bark with all sorts of texts written on them. The 915 items are mostly letters, notes and receipts, all written between the 11th and 15th century. Among the more notable scraps is a marriage proposal from a man called Mikita to his beloved Anna: “marry me - I want you and you want me, and the witness to that is Ignat Moiseev” (item 377). 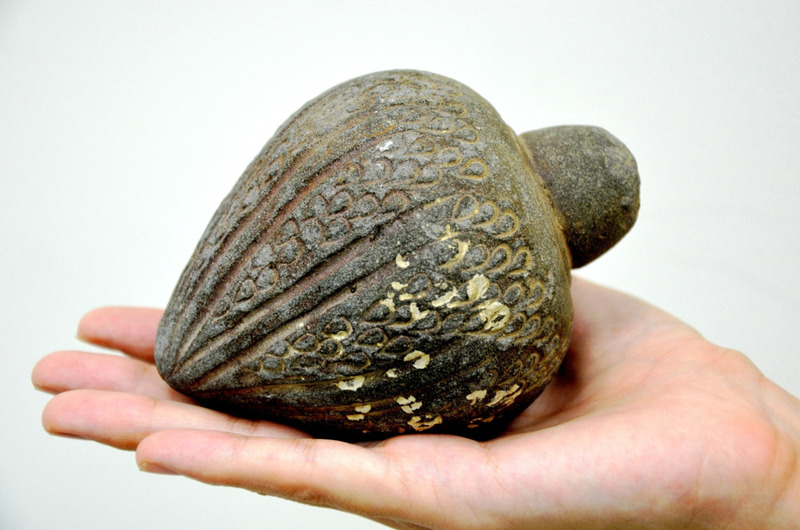 The most special items, however, are the ones shown above, which are from a medieval classroom. In the 13th century, young schoolboys learning to write filled these scraps with alphabets and short texts. Bark was ideal material for writing down things with such a short half-life. Then the pupils got bored and started to doodle, as kids do: crude drawings of individuals with big hands, as well as a figure with a raised sword standing next to a defeated beast (lower image). The last one was drawn by Onfim, who put his name next to the victorious warrior. The snippets provide a delightful and most unusual peek into a 13th-century classroom, with kids learning to read - and getting bored in the process. 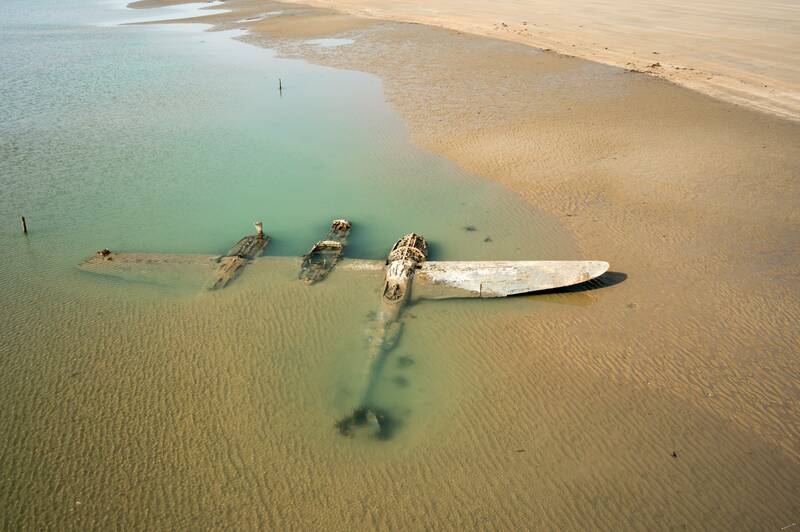 Sixty-five years after it crash-landed on a beach in Wales, an American P-38 fighter plane has emerged from the surf and sand where it lay buried — a World War II relic long forgotten by the US government and unknown to the British public. The Lockheed “Lightning” fighter, with its distinctive twin-boom design, has suddenly reappeared due to unusual conditions which caused the sands to shift and erode. It was first spotted by a family enjoying a day at the beach on July 31 and a team of US specialists were informed and flew over to survey the site. The twin-engine P-38, a radical design conceived by Lockheed design genius Clarence “Kelly” Johnson in the late 1930s, became one of the war’s most successful fighter planes, serving in Europe and the Pacific. Some 10,000 were built, and about 32 complete or partial airframes are believed to still exist, perhaps 10 in flying condition. Second Lt. Robert F. “Fred” Elliott, 24, of Rich Square, North Carolina, was on a gunnery practice mission on Sept. 27, 1942, when a fuel supply error forced him to make an emergency landing on the nearest suitable place — the Welsh beach. His belly landing in shallow water sheared off a wingtip, but Elliott escaped unhurt. Less than three months later, the veteran of more than 10 combat missions was shot down over Tunisia, in North Africa. His plane and body were never found.